Studies of human asthma and of animal models of allergic airway inflammation revealed a crucial role for Th2 cells in the pathogenesis of allergic asthma. Kruppel-type zinc finger proteins are the largest family of a regulatory transcription factor for cellular development and function. Zinc finger protein (Zfp) 35 is an 18-zinc finger motif-containing Kruppel-type zinc finger protein, while its function remains largely unknown. The aim of this study was to clarify the role of Zfp35 in the pathogenesis of Th2-dependent allergic inflammation, such as allergic asthma. We examined airway eosinophilic inflammation and hyperresponsiveness in two mouse models, which use our newly generated Zfp35-deficient (Zfp35−/−) mice and adoptive transfer of cells. In Zfp35−/− mice, Th2 cell differentiation, Th2 cytokine production, eosinophilic inflammation, and airway hyperresponsiveness were substantially enhanced. Furthermore, adoptive transfer of Ag-sensitized Zfp35−/− CD4 T cells into the asthmatic mice resulted in enhanced airway inflammation and airway hyperresponsiveness. These results indicate that Zfp35 controls Th2 cell differentiation, allergic airway inflammation, and airway hyperresponsiveness in a negative manner. Thus, Zfp35 may control Th2-dependent diseases, such as allergic asthma. Asthma is a chronic inflammatory disease of the lower airways that causes airway hyperresponsiveness (AHR)3 to a wide variety of specific and nonspecific stimuli (1, 2). Acute allergic asthma represents airway inflammation predominated by eosinophils, hypersecretion of mucus, and AHR. The involvement of Th2 cells in the pathogenesis of allergic asthma has been well recognized through the studies of human asthma as well as of animal models of allergic airway inflammation (3, 4, 5, 6, 7, 8, 9). It is well recognized that CD4+ effector Th cells are categorized into three subsets, Th1, Th2, and Th17 cell subsets. Th1 cells produce IFN-γ and direct cell-mediated immunity against intracellular pathogens. Th2 cells produce IL-4, IL-5, and IL-13 and are involved in humoral immunity and allergic reactions. Th17 cells, a recently identified population (10), produce IL-17 and play a critical role in the pathogenesis of autoimmune diseases (11, 12, 13). Several transcription factors that control the differentiation of these Th subsets have been identified. Among them, a zinc finger transcription factor GATA3 appears to be a key transcription factor for Th2 cell differentiation (14, 15), T-bet for Th1 (16), and Retinoid-related orphan receptor γ t for Th17 cell differentiation (17). Transcription factors play critical roles in a variety of cellular processes, such as differentiation, proliferation, cell death, and survival through specific induction/repression of the target genes (18, 19, 20). The Cys2His2 (C2H2)-type zinc finger proteins (Zfps) are one of the well-defined eukaryotic DNA-binding proteins, and ∼700 genes existed in the human genome (21, 22, 23). The C2H2-type zinc finger motif is composed of 21 aa with a consensus sequence of CX2CX3FX5LX2HX3H and contains two conserved cysteine and histamine residues that coordinate a zinc ion and fold the domain into a finger-like structure (24, 25). The investigation of C2H2-type Zfps suggested their unique and specific roles in the regulation of lymphocyte development. For example, Egr-3, Zfp608, Th-POK, and Gfi-1 are shown to be involved in the differentiation of T cells (26, 27, 28, 29). We have recently reported that Schnurri-2 plays a crucial role in the control of Th2 cell differentiation by regulating NF-κB functions (30, 31). In particular, Zfps that possess many zinc finger motifs, such as PLZF, SKAT-2, ZEB, and ZNF304 (these have 9, 14, 7, and 13 zinc finger motifs, respectively), control the IL-4 production from either CD4 T or NKT cells (32, 33, 34, 35). We selected Zfp35 (also known as znf271) in a subtraction analysis where a relatively increased expression of Zfp35 was detected in IL-4low-producing cells in comparison to IL-4high- producing cells in in vitro-generated Th2 cells. Zfp35 belongs to C2H2-type Zfp family and contains 18 continuous typical C2H2 zinc fingers in its C-terminal and contains one acidic region with a numbers of glutamic and aspartic acid domain in its N terminus (36). A human homolog of Zfp35, ZNFEB, was identified in EBV-positive B cells and shows ∼79% homology at the amino acid level compared with mice (37). The rat homolog Zfp239 was identified in the cDNA library of the spleen by the Mammalian Gene Collection Program and shows ∼84% homology at the amino acid level compared with mice (38). However, the physiological function of Zfp35 and homologs in the immune system has not been investigated. In this study, we have established Zfp35-deficient (Zfp35−/−) mice with either a BALB/c or a C57BL/6 background and investigated the role of Zfp35 in Th1/Th2 cell differentiation and also in the pathogenesis of Th2-dependent allergic airway inflammation. Our results indicate that Zfp35 negatively regulates Th2 cell differentiation and Th2-driven airway allergic inflammation. We have newly established Zfp35−/− mice and were backcrossed to either BALB/c or C57BL/6 10 times. Zfp35−/− × DO11.10-transgenic (Tg) (an anti-OVA-specific TCR-αβ Tg) mice (39) were used at 6–8 wk old. BALB/c and C57BL/6 mice were purchased from CLEA Japan. All mice used in this study were maintained under specific pathogen-free conditions. Animal care was conducted in accordance with the guidelines of Chiba University. Splenic CD4 T cells were purified by using magnetic beads and an AutoMACS Sorter (Miltenyi Biotec) yielding a purity of >98%. Where indicated, splenic CD4 T cells with naive phenotype (CD44low) and eosinophils in the bronchoalveolar lavage (BAL) fluid were isolated on a FACSAria cell sorter (BD Biosciences), yielding a purity of >98% as previously described (40). The lung mononuclear cells were isolated as described previously (41). Naive splenic CD4 T cells were stimulated with 3 μg/ml immobilized ant-TCR-β mAb (H57-597) in the presence of 25 U/ml IL-2 and 1–100 U/ml IL-4 as described previously (42). For Th1 cell differentiation, naive splenic CD4 T cells were stimulated with 3 μg/ml immobilized anti-TCR-β mAb (H57-597) in the presence of 25 U/ml IL-2, IL-12, and anti-IL-4 mAb. In brief, 1.5 × 104 sorted DO11.10 Tg CD44low CD4 T cells were stimulated with antigenic OVA peptide (Loh15, OVA323–339, 0.1 μM) and 105 irradiated (3500 rad) normal BALB/c splenocytes. Appropriate cytokines and anti-cytokine Abs were added in Th1/Th2 cell differentiation cultures as described previously (40). In typical DO11.10 Tg T cell cultures, Th2 cell-skewed (IL-4 with anti-IL-12 mAb and anti-IFN-γ mAb) and Th1 cell-skewed (IL-12 with anti-IL-4 mAb) conditions were used. The production of IL-2, IL-4, IL-5, IL-10, and IFN-γ were measured by ELISA as described elsewhere(43). The production of IL-13 was measured by a mouse IL-13 ELISA kit (R&D Systems) according to the manufacturer’s protocol. In general, one million cells were stained with Abs as indicated according to a standard method (44, 45). Quantitative RT-PCR was performed as described previously using an Applied Biosystems PRISM 7500 Sequence Detection System under standard conditions (46, 47). The primers for TaqMan probes for the detection of Zfp35 (exons 2 and 3), muc5ac, gob5, IL-4, IL-5, IL-13, eosinophil peroxidase (EPO), and HPRT were purchased from Applied Biosystems. One day after the last challenge with OVA, BAL was prepared as previously described (48). Total BAL fluid was collected and cells in 100-μl aliquots were counted. One hundred thousand viable BAL cells were cytocentrifuged onto slides by a Cytospin 3 (Shandon) and stained with May-Grünwald-Giemsa solution (Merck) as described elsewhere (49). Five hundred leukocytes were counted on each slide. Cell types were identified using morphological criteria. The percentages of each cell type were calculated. Cytokines levels in the BAL fluid were measured 6 h after the last OVA challenges. Mice were immunized with 1 mg of OVA in alum on day 0. They were challenged on days 7 and 9 intranasally with 100 μg of OVA in 30 μl of saline under anesthesia as previously described (50). Splenic CD4 T cells from OVA-immunized wild-type or zfp35-deficient BALB/c mice on day 10 were isolated by the panning method as previously described (40). Prepared CD4 T cells (1.5 × 107 cells) were i.v. transferred into wild-type BALB/c mice. Transferred mice were challenged on days 11 and 13 intranasally as above. AHR responses were assessed by methacholine-induced airflow obstruction in conscious mice placed in a whole-body plethysmograph (Buxco Electronics) as described previously (50). Airway function was also assessed by measuring the changes in lung resistance (RL) and dynamic compliance in response to increasing doses of inhaled methacholine, as described previously (51, 52). The lung samples taken on day 11 were sectioned, stained with H&E reagents, periodic acid-Schiff reagents, and Luna reagents as described previously (50). The significance between two groups was determined by two-tailed Student’s t test. Mann-Whitney U tests were used to determine the level of difference in the degree of AHR. To functional analyze the Zfp35, the targeting strategy to inactivate Zfp35 is described in Fig. 1⇓. Germline chimeras and mice heterozygous for the mutated Zfp35 gene were generated as described in Materials and Methods. Southern blot analysis with the 3′ external probe confirmed the correct recombination (Fig. 1⇓B). We also assessed the mRNA expression of Zfp35 in freshly prepared splenic CD4 T cells from BALB/c and Zfp35-deficient mice. Real-time RT-PCR analysis demonstrated that there was no detectable Zfp35 transcript in Zfp35-deficient splenic CD4 T cells (Fig. 1⇓C). Targeted disruption of mouse Zfp35 gene. A, Schematic representation of the Zfp35 gene, the targeting vector, and the predicted disrupted gene. The probes used for Southern blot analyses are shown along with the predicted sizes of the hybridizing fragments. The open boxes represent translated exons, respectively. B, Southern blot analysis of genomic DNA extracted from the tails of wild-type (+/+), Zfp35+/− (+/−), and Zfp35−/− (−/−) mice. Genomic DNA digested with XbaI was hybridized with the probe to yield 5.5- and 2.0-kb bands; these represented the wild-type (WT) and knockout (KO) alleles, respectively. C, RNAs were prepared from fresh splenic CD4+ T cells of wild-type (+/+), Zfp35+/− (+/−), and Zfp35−/− (−/−) mice, and then expression levels of Zfp35 were determined by the RT-PCR method. Three independent experiments were performed with similar results. n.d., Not detected. D, Representative CD4/CD8 profiles of thymocytes and splenocytes of Zfp35−/− mice with a BALB/c background. Representative yields of thymocytes and splenocytes are shown in the box. We found that moderate numbers of CD4 and CD8 T cells were present in Zfp35-deficient mice of a BALB/c and C57BL/6 back ground (Fig. 1⇑D and data not shown). The cell surface expression of TCR-β, CD3ε, CD25, CD69, CD44, and CD62L on thymic and splenic CD4 and CD8 T cells was found to be comparable to those of controls (data not shown). In addition, anti-TCR-β mAb-, IL-2-, or peptide-induced proliferative responses were indistinguishable between wild-type and Zfp35−/− splenic CD4 T cells (data not shown). Thus, no obvious defect in the phenotype or the activation of Zfp35−/− splenic CD4 T cells was noted. To examine the influence of Th cell differentiation in the naive Zfp35−/− CD4 T cells, we used the in vitro Th1/Th2 cell differentiation method and examined the response by intracellular cytokine staining (40, 53). Naive splenic CD4 T cells (CD4+CD44low) were purified by cell sorting (purity >98%). An assessment of the capability of Zfp35−/− CD4 T cells to differentiate into Th1/Th2 cells in vitro indicated a moderate enhancement of Th2 cell differentiation under Th2 conditions (18.8% vs 26.5% and 29.3% vs 42.3%; Fig. 2⇓B), while Th1 cell differentiation was equivalent at the same IL-12 dose (Fig. 2⇓A). The ability to produce Th2 cytokines was then assessed by ELISA. As shown in Fig. 2⇓E, the production of IL-4, IL-5, and IL-13 increased about 2- to 4-fold in zfp35-deficient Th2 cells. IFN-γ production was not detectable in the cultured Th2 cells. Enhanced Th2 cell differentiation in Zfp35−/− CD4 T cells. A and B, The ability to differentiation into Th1/Th2 cells from Zfp35−/− × DO 11.10 Tg mice was assessed. The results are representative of five experiments. C and D, Naive (CD44low) CD4 T cells from Zfp35−/− mice were purified by cell sorting and stimulated with immobilized anti-TCR-β mAb (3 μg/ml) under Th1/2 conditions for 5 days. The results are representative of five experiments. E, A fraction of the same differentiated cell cultures used in B were restimulated with anti-TCR-β mAb for the indicated times. The mean cytokine concentration is shown with SDs. Three independent experiments were performed with similar results. n.d., Not detected. Next, to further examine the efficiency in Th2 cell differentiation of Zfp35−/− T cells, purified splenic CD4 T cells were stimulated with immobilized anti-TCRβ mAb in graded doses of exogenous cytokines. Th2 cell differentiation was enhanced in Zfp35−/− T cells at any doses of exogenous IL-4, particularly the enhancement was more prominent under relatively lower IL-4 conditions, whereas Th1 cell differentiation was unaffected (Fig. 2⇑, C and D). In addition, proliferative responses induced with antigenic peptide, IL-2, or IL-4 were indistinguishable between wild-type and Zfp35−/− effector Th2 cells (data not shown). These results thus far suggest that Zfp35 regulates Th2 cell differentiation in a negative manner. To assess the role of Zfp35 in allergic airway inflammation, the BAL fluid of OVA-immunized and OVA-inhaled wild-type and Zfp35−/− (BALB/c background) mice was collected 48 h after the last OVA challenge (Fig. 3⇓A). The number of total infiltrating cells and the absolute number of eosinophils and the percentages of eosinophils per mouse increased significantly in Zfp35−/− mice (Fig. 3⇓, B and C). The cytokines (IL-4, IL-5, IL-13, and IFN-γ) in the BAL fluid were also measured by ELISA. Under our conditions, IL-4 and IL-5 were detectable and were significantly increased in the Zfp35−/− mice (Fig. 3⇓D). IL-13 and IFN-γ were undetectable in the BAL fluid. We evaluated the numbers of infiltrated eosinophils by Luna staining (Fig. 3⇓E). The eosinophilic infiltration was observed to be enhanced in Zfp35−/− mice and the infiltration extended to the surrounding regions in Zfp35−/− mice (data not shown). Increased OVA-induced airway inflammation and AHR in Zfp35−/− mice. A, BALB/c mice were injected i.p. with 250 μg of OVA in 4 mg of aluminum hydroxide gel on day 0. Mice were then treated intranasally with 100 μg of OVA in 30 μl of saline under anesthesia as described (challenge). On day 11, AHR and RL were assessed. On day 12, BAL fluid cells were prepared. Samples for histological analysis were prepared on day 12. The percentage (B) and absolute cell number (C) of eosinophils (Eos. ), lymphocytes (Lym. ), neutrophils (Neut. ), and macrophages (Mac.) in BAL fluid are shown with SE. Four mice group were used. ∗, p < 0.01. D, Six hours after the second intranasal challenge, cytokine concentrations in the BAL fluid were measured by ELISA. The values with SDs are shown. Three mice per group were used. ∗, p < 0.01 and ∗∗, p < 0.05. E, The lungs were fixed and stained with Luna. The eosinophil numbers in the peribronchiolar region (mean cell number per mm2 with SDs) are also shown. Three mice per group were used. ∗, p < 0.01. AHR in response to increasing doses of methacholine was assessed by measuring enhanced pause (Penh; F) or airway resistance (RL; G). Mean values of the percent above baseline are shown with SD. A total of three independent experiments was performed with similar results. ∗, p < 0.01 and ∗∗, p < 0.05. To evaluate the levels of AHR, OVA-immunized wild-type and Zfp35−/− mice were exposed to intranasal-treated OVA. Then AHR was assessed by measuring the methacholine-induced airflow obstruction in a whole-body plethysmograph and the respiratory system resistance using a computer-controlled small animal ventilator. As shown in Fig. 3⇑, F and G, the augmented hyperresponsiveness to methacholine was detected in Zfp35−/− mice compared with Zfp35+/+ control mice. Specific staining of mucus-containing epithelial cells was not detected in wild-type or Zfp35−/− mice when OVA was not challenged (Fig. 4⇓A, control (Cont. ), a and b). 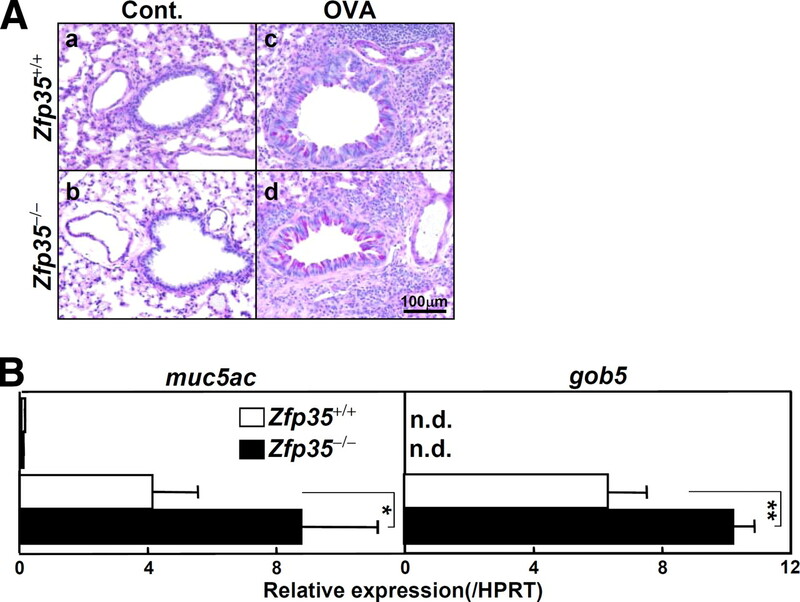 After the OVA challenge, Zfp35−/− mice showed a mildly increased mucus production in the airway epithelium in comparison to wild-type mice (Fig. 4⇓A, c and d). Subsequently, we examined the expression of muc5ac and gob5 in the asthmatic lung of Zfp35−/− mice. The expression of these genes in the lung of Zfp35−/− mice significantly increased as compared wild-type mice (Fig. 4⇓B). Taken together, these results indicated that allergic airway inflammation, mucus production, and AHR were all enhanced in Zfp35−/− mice. Thus, Zfp35 appears to be one of the key transcription factors in mediating Th2-dependent airway inflammation. Hypermucus production in Zfp35−/− mice. A, Ag-induced goblet cell hyperplasia was evaluated by periodic acid-Schiff staining. Representative photographic views of wild-type and Zfp35−/− mice (BALB/c background) are shown (a–d). B, Total RNA was prepared from the lung of asthmatic wild-type or Zfp35−/− mice and mRNA levels of muc5ac and gob5 were examined. The data represent the mean values of muc5ac and gob5 mRNA expression normalized with hprt expression. Three independent experiments were done with similar results (∗, p < 0.01 and ∗∗, p < 0.05). n.d., Not detected; Cont., control. Th2 cells predominantly express CCR3 and CCR4 (54, 55, 56). Consequently, we examined the cell surface expression of CCR3 and CCR4 on CD4 T cells in OVA-immunized and -challenged Zfp35−/− mice. The expression of these chemokine receptors was very low either on CD44high or CD44low splenic CD4 T cells, and no difference was detected between wild-type and Zfp35−/− mice (Fig. 5⇓A), thus indicating that CD4 T cells in the spleen of Zfp35−/− mice were not spontaneously polarized. The expression of surface makers on CD4 T cells of OVA-immunized and -challenged Zfp35−/− mice. The mice were injected i.p. with OVA/alum on day 0. On days 7 and 9, the mice were treated intranasally with OVA (challenge). On day 12, lung mononuclear cells and splenocytes were prepared. A, Splenocytes were stained with anti-CD4, anti-CD44, and anti-CCR3 mAb or anti-CCR4 mAb. B, Splenocytes and lung mononuclear cells were stained with anti-CD4 and one of anti-CD25, anti-CD44, and anti-CD69 mAbs. The percentages of each quadrant are shown. The percentages among the CD4 T cells are given in parentheses. Three independent experiments were done with similar results. We also examined the expression of CD25, CD44, and CD69 on the splenic CD4 T cells and lung CD4 T cells in OVA-immunized and -challenged Zfp35−/− mice (Fig. 5⇑B). The number of CD25+ and CD69+ CD4 T cells in the lung slightly increased in the OVA-immunized and -challenged mice in comparison to nonimmunized mice, but the numbers of CD25+, CD44+, and CD69+ cells in the Zfp35−/− groups were comparable to those of the wild type. These results indicate that CD4 T cells in the spleen and the asthmatic lung of Zfp35−/− mice were not spontaneously activated even after OVA immunization and challenge. We isolated the BAL fluid from OVA-immunized and -challenged Zfp35−/− mice, and CD4 T cells and I-Ad- negative, Gr-1, and CCR3-positive eosinophils were isolated by a cell sorter. The mRNA expression of IL-4, IL-5, and IL-13 in the BAL fluid CD4 T cells was assessed, and the expression of IL-4 and IL-13 was increased in Zfp35−/− mice (Fig. 6⇓A). The percentages of I-Ad-negative, Gr-1, and CCR3- positive eosinophils were slightly increased (Fig. 6⇓B). The levels of IL-4, IL-5, IL-13, and EPO mRNA expression in the sorted eosinophils were examined. The levels of IL-4, IL-13, and EPO expression were increased substantially in the Zfp35−/− groups in comparison to the wild type (Fig. 6⇓C). The expression of IL-5 was not detected in this experimental system. Increased Th2 cytokine production of CD4 T cells and eosinophils in the BAL fluid of OVA-immunized and -challenged Zfp35−/− mice. The mice were immunized and challenged with OVA as described in Fig. 5. On day 12, BAL fluid cells were prepared and pooled from 10 mice per group. CD4 T cells and I-Ad-negative, Gr-1, and CCR3-positive eosinophils were isolated by a cell sorter. A, The mRNA expression of IL-4, IL-5, and IL-13 in the BAL fluid CD4 T cells was assessed by quantitative RT-PCR. B, Eosinophils in the BAL fluid were stained with anti-I-Ad, anti-Gr-1, and anti-CCR3 mAbs. Representative staining profiles of CCR3/Gr-1 on I-Ad-negative cells are shown. Percentages of CCR3+Gr-1+ cells in the BAL fluid are also indicated. C, The mRNA expression levels of IL-4, IL-13, and EPO in the eosinophils are shown. n.d., Not detected. Three independent experiments were done with similar results. Finally, we addressed whether OVA-primed T cells with altered Zfp35 expression are able to modulate OVA-induced allergic inflammation. Following immunization with OVA, splenic CD4 T cells from BALB/c and Zfp35−/− mice (BALB/c background) were prepared and transferred into BALB/c mice that had been also immunized with OVA once (Fig. 7⇓A). Two and 4 days after cell transfer, mice were challenged with intranasal administration of OVA and the inflammatory infiltrates in the BAL fluid were analyzed. As shown in Fig. 7⇓, B and C, the adoptive transfer of CD4 T cells from Zfp35−/− mice resulted in increased levels of eosinophilic infiltrates. As shown in Fig. 7⇓, D and E, the hyperresponsiveness to methacholine in Zfp35−/− mice was enhanced compared with that in control mice. These results indicate that the expression levels of Zfp35 in CD4 T cells appear to affect the OVA-induced airway inflammation and AHR. Increased airway inflammation and AHR induced by Zfp35−/− CD4 T cell transfer. A, Donor mice (Zfp35+/+ or Zfp35−/− mice, BALB/c background) and recipient mice (BALB/c) were sensitized i.p. with 250 μg of OVA with alum on day 0. On day 10, splenic CD4 T cells were prepared from donor mice and transferred into recipient mice. The recipient mice were treated intranasally with 100 μg of OVA in 30 μl of saline under anesthesia on days 11 and 13. On day 14, AHR and RL were assessed. BAL fluid was collected on day 15. The percentage (B) and absolute cell number (C) of eosinophils (Eos. ), lymphocytes (Lym. ), neutrophils (Neut.) and macrophages (Mac.) in BAL fluid are shown. Four mice per group were used. AHR in response to increasing doses of methacholine was assessed by measuring enhanced pause (Penh; D) or airway resistance (RL; E). Mean values of the percentage above baseline are shown with SDs. A total of three independent experiments were performed with similar results. ∗, p < 0.01 and ∗∗, p < 0.05. In this report, we demonstrated that Zfp35−/− CD4 T cells differentiate into Th2 cells more efficiently (Fig. 2⇑). The development of eosinophilic airway inflammation, mucus hyperproduction, and AHR was shown to be enhanced in Zfp35−/− mice (Figs. 3⇑ and 4⇑). Th2 cytokine expression of CD4 T cells and eosinophils of BAL fluid in the challenged Zfp35−/− mice increased (Fig. 6⇑). Moreover, the cell transfer of OVA-sensitized Zfp35−/− CD4 T cells modulated the airway inflammation (Fig. 7⇑), thus indicating that Zfp35 plays an important role in the pathogenesis of airway inflammation and hyperresponsiveness through the control of Th2 cell generation and Th2 cytokine expression. The absolute number of eosinophils in the BAL fluid is enhanced after OVA challenge (Figs. 3⇑C and 7⇑C). An increase in the percentage of eosinophils in the Zfp35−/− mice was also observed in the experiments shown in Fig. 3⇑, and no remarkable change was observed in the cell transfer experiments (Fig. 7⇑B). In addition, an increased IL-4 and IL-13 production in the eosinophils in the BAL fluid was detected (Fig. 6⇑C). Thus, Zfp35 in Th2 cells and also in eosinophils appears to play an important role in the regulation of OVA-induced allergic airway inflammation. No preferential expression of Zfp35 was detected between Th1 and Th2 cells (M. Kitajima and T. Nakayama, unpublished observation), while the enhancement of Th2 cell differentiation but not Th1 or Th17 cell differentiation was detected (Fig. 2⇑ and our unpublished observation). GATA3 is one of crucial factors in Th2 differentiation and airway inflammation (57, 58, 59). Therefore, Zfp35 may regulate Th2-specific processes, such as those involving GATA3. However, the GATA3-dependent promoter activity on IL-5 promoter was not affected by Zfp35 (M. Kitajima and T. Nakayama, unpublished observation). Thus, Zfp35 appears to control a process that is required for Th2 cell differentiation but not GATA3-mediated transcriptional processes. Increasing numbers of transcription factors implicated in the development of allergic airway inflammation are reported; STAT factors, NF-κB, NFAT, AP-1 family protein, and Th2 cell-related transcription factors including GATA3, JunB, and c-Maf (60). Zinc finger transcription factors including Schnurri-2 (41) and repressor of GATA (ROG) (61) control the allergic airway inflammation. The Zfp35 gene was clustered with znf191 and znf397 in mouse chromosome 18A12 (62, 63). ZNF191 has been identified in a T cell line, contains four C2H2 zinc finger domains, and znf191-deficient mice died at ∼7.5 days after fertilization (64). ZNF397 possesses nine C2H2 zinc finger domains and is expressed in the spleen and thymus at low levels and acts as a transcriptional activator (63). The precise immunological function of these molecules was not investigated at this time. We examined the levels of mRNA expression of znf191 and znf397 in splenic Zfp35−/− CD4 T cells by a RT-PCR method, and the expression was found to be normal (M. Kitajima and T. Nakayama, unpublished observation). This indicates that the observed effects on Th2 cell differentiation and airway inflammation in Zfp35-deficient mice are not the result of an altered expression of the neighboring genes znf191 and znf397in the same cluster. The evolutional relationship among amino acid sequences of different Zfps with phylogenic tree analysis was reported (65). ZNF322 and ZNF328 are closely related to Zfp35 in the phylogenic tree (65, 66). ZNF322 contains nine zinc finger domains and regulates in a positive manner in MAPK signaling pathways. ZNF328 contains 15 zinc finger domains and 1 KRAB domain and regulates negatively the MAPK signaling pathways. Although no apparent effect of Zfp35 on the activation of the ERK MAPK cascades was detected in Th2 cells (M. Kitajima and T. Nakayama, unpublished observation), Zfp35 may also have a regulatory function on the MAPK signaling cascade in other cells. ZNFEB maps to human chromosome 18q12(62). The 18q12 region is known to be a hot spot for structural cytogenetic changes in numerous different malignancies (37). The mRNA expression of ZNFEB, a human homolog of Zfp35, is transiently induced upon activation of human B cells by anti-IgM F(ab′)2 or a phorbol ester plus calcium ionophore (37). These observations suggest that ZNFEB is a candidate key molecule involved in the pathogenesis of hematopoietic malignancies and immune disorders. Thus, Zfp35-deficient mice may provide a good experimental system for the analysis of the role of this interesting molecule. Zinc deficiency was reported to be correlated with the Th2 inflammatory cytokine profile (67). Case-control studies in Scotland (68) and Spain (69) found that the combined risk of atopy, bronchial reactivity, and allergic-type symptoms were 4- to 5-fold higher in individuals with low zinc intake compared with those with higher zinc intakes. Significant decreases in serum, plasma, or hair zinc levels have also been reported in some asthmatic individuals (70). Intracellular Zn exists in two discreet pools, the first being nonexchangeable and tightly bound to metalloenzymes, and the second being a more labile and dynamic pool that is rapidly exchangeable and able to be altered by Zn deprivation or supplementation (71). It is possible that Zfp35 containing 18 continuous zinc (72) finger motifs partly maintain intracellular zinc homeostasis, thereby controlling allergic asthma. We are grateful to Kaoru Sugaya, Toshihiro Ito, and Hikari Asou for excellent technical assistance. ↵1 This work was supported by the Global Center for Education Program (Global Center for Education and Research in Immune System Regulation and Treatment), Monbukagakusho (Japan), and by grants from the Ministry of Education, Culture, Sports, Science and Technology (Japan) (Grants-in-Aid for Scientific Research on Priority Areas no. 17016010 and no. 20060003; Scientific Research (B) no. 21390147, Scientific Research (C) no. 21591808 and no. 20590485, and Young Scientists (B) no. 20790367; and Start-up no. 20890038: Cancer Translational Research Project), the Ministry of Health, Labor and Welfare (Japan), and The Japan Health Science Foundation, Kanae Foundation, and Uehara Memorial Foundation. ↵3 Abbreviations used in this paper: AHR, airway hyperresponsiveness; BAL, bronchoalveolar lavage; EPO, eosinophil peroxidase; Zfp, zinc finger protein; Tg, transgenic; RL, lung resistance. McFadden, E. R., Jr, I. A. Gilbert. 1992. Asthma. N. Engl. J. Med. 327: 1928-1937. Busse, W. W., R. F. Lemanske, Jr. 2001. Asthma. N. Engl. J. Med. 344: 350-362. Hamelmann, E., E. W. Gelfand. 2001. IL-5-induced airway eosinophilia: the key to asthma?. Immunol. Rev. 179: 182-191. Lloyd, C. M., J. A. Gonzalo, A. J. Coyle, J. C. Gutierrez-Ramos. 2001. Mouse models of allergic airway disease. Adv. Immunol. 77: 263-295. Elias, J. A., C. G. Lee, T. Zheng, B. Ma, R. J. Homer, Z. Zhu. 2003. New insights into the pathogenesis of asthma. J. Clin. Invest. 111: 291-297. Kamata, T., M. Yamashita, M. Kimura, K. Murata, M. Inami, C. Shimizu, K. Sugaya, C. R. Wang, M. Taniguchi, T. Nakayama. 2003. src homology 2 domain-containing tyrosine phosphatase SHP-1 controls the development of allergic airway inflammation. J. Clin. Invest. 111: 109-119. Wills-Karp, M.. 2004. Interleukin-13 in asthma pathogenesis. Immunol. Rev. 202: 175-190. Umetsu, D. T., R. H. DeKruyff. 2006. The regulation of allergy and asthma. Immunol. Rev. 212: 238-255. Harrington, L. E., R. D. Hatton, P. R. Mangan, H. Turner, T. L. Murphy, K. M. Murphy, C. T. Weaver. 2005. Interleukin 17-producing CD4+ effector T cells develop via a lineage distinct from the T helper type 1 and 2 lineages. Nat Immunol. 6: 1123-1132. Park, H., Z. Li, X. O. Yang, S. H. Chang, R. Nurieva, Y. H. Wang, Y. Wang, L. Hood, Z. Zhu, Q. Tian, C. Dong. 2005. A distinct lineage of CD4 T cells regulates tissue inflammation by producing interleukin 17. Nat Immunol. 6: 1133-1141. Zhang, D. H., L. Cohn, P. Ray, K. Bottomly, A. Ray. 1997. Transcription factor GATA-3 is differentially expressed in murine Th1 and Th2 cells and controls Th2-specific expression of the interleukin-5 gene. J. Biol. Chem. 272: 21597-21603. Szabo, S. J., B. M. Sullivan, C. Stemmann, A. R. Satoskar, B. P. Sleckman, L. H. Glimcher. 2002. Distinct effects of T-bet in TH1 lineage commitment and IFN-γ production in CD4 and CD8 T cells. Science 295: 338-342. Maldonado, E., M. Hampsey, D. Reinberg. 1999. Repression: targeting the heart of the matter. Cell 99: 455-458. Zawel, L., D. Reinberg. 1995. Common themes in assembly and function of eukaryotic transcription complexes. Annu. Rev. Biochem. 64: 533-561. Ghaleb, A. M., M. O. Nandan, S. Chanchevalap, W. B. Dalton, I. M. Hisamuddin, V. W. Yang. 2005. Kruppel-like factors 4 and 5: the yin and yang regulators of cellular proliferation. Cell Res. 15: 92-96. Venter, J. C., M. D. Adams, E. W. Myers, P. W. Li, R. J. Mural, G. G. Sutton, H. O. Smith, M. Yandell, C. A. Evans, R. A. Holt, et al 2001. The sequence of the human genome. Science 291: 1304-1351. Lander, E. S., L. M. Linton, B. Birren, C. Nusbaum, M. C. Zody, J. Baldwin, K. Devon, K. Dewar, M. Doyle, W. FitzHugh, et al 2001. Initial sequencing and analysis of the human genome. Nature 409: 860-921. Tupler, R., G. Perini, M. R. Green. 2001. Expressing the human genome. Nature 409: 832-833. Klug, A., J. W. Schwabe. 1995. Protein motifs 5. Zinc fingers. FASEB J. 9: 597-604. Bellefroid, E. J., P. J. Lecocq, A. Benhida, D. A. Poncelet, A. Belayew, J. A. Martial. 1989. The human genome contains hundreds of genes coding for finger proteins of the Kruppel type. DNA 8: 377-387. Zhang, F., L. R. Thomas, E. M. Oltz, T. M. Aune. 2006. Control of thymocyte development and recombination-activating gene expression by the zinc finger protein Zfp608. Nat. Immunol. 7: 1309-1316. Kappes, D. J., X. He, X. He. 2006. Role of the transcription factor Th-POK in CD4:CD8 lineage commitment. Immunol. Rev. 209: 237-252. Zhu, J., D. Jankovic, A. Grinberg, L. Guo, W. E. Paul. 2006. Gfi-1 plays an important role in IL-2-mediated Th2 cell expansion. Proc. Natl. Acad. Sci. USA 103: 18214-18219. Kimura, M. Y., H. Hosokawa, M. Yamashita, A. Hasegawa, C. Iwamura, H. Watarai, M. Taniguchi, T. Takagi, S. Ishii, T. Nakayama. 2005. Regulation of T helper type 2 cell differentiation by murine Schnurri-2. J. Exp. Med. 201: 397-408. Kimura, M. Y., C. Iwamura, A. Suzuki, T. Miki, A. Hasegawa, K. Sugaya, M. Yamashita, S. Ishii, T. Nakayama. 2007. Schnurri-2 controls memory Th1 and th2 cell numbers in vivo. J. Immunol. 178: 4926-4936. Blanchard, A. D., K. R. Page, H. Watkin, P. Hayward, T. Wong, M. Bartholomew, D. J. Quint, M. Daly, J. Garcia-Lopez, B. R. Champion. 2000. Identification and characterization of SKAT-2, a novel Th2-specific zinc finger gene. Eur. J. Immunol. 30: 3100-3110. Kovalovsky, D., O. U. Uche, S. Eladad, R. M. Hobbs, W. Yi, E. Alonzo, K. Chua, M. Eidson, H. J. Kim, J. S. Im, P. P. Pandolfi, D. B. Sant'Angelo. 2008. The BTB-zinc finger transcriptional regulator PLZF controls the development of invariant natural killer T cell effector functions. Nat. Immunol. 9: 1055-1064. Sabater, L., Y. Ashhab, P. Caro, E. C. Kolkowski, R. Pujol-Borrell, O. Dominguez. 2002. Identification of a KRAB-containing zinc finger protein, ZNF304, by AU-motif-directed display method and initial characterization in lymphocyte activation. Biochem. Biophys. Res. Commun. 293: 1066-1072. Yasui, D. H., T. Genetta, T. Kadesch, T. M. Williams, S. L. Swain, L. V. Tsui, B. T. Huber. 1998. Transcriptional repression of the IL-2 gene in Th cells by ZEB. J. Immunol. 160: 4433-4440. Cunliffe, V., P. Koopman, A. McLaren, J. Trowsdale. 1990. A mouse zinc finger gene which is transiently expressed during spermatogenesis. EMBO J. 9: 197-205. Tune, C. E., M. Pilon, Y. Saiki, H. M. Dosch. 2002. 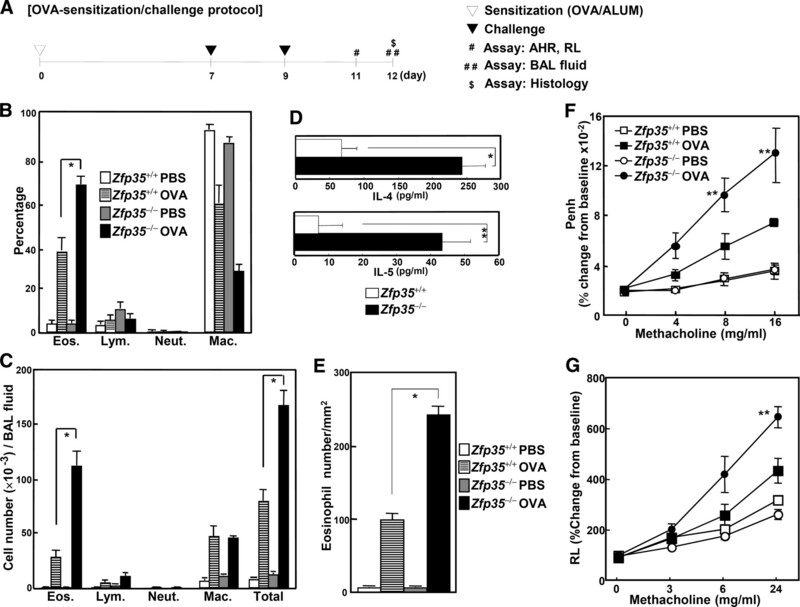 Sustained expression of the novel EBV-induced zinc finger gene, ZNFEB, is critical for the transition of B lymphocyte activation to oncogenic growth transformation. J. Immunol. 168: 680-688. Strausberg, R. L., E. A. Feingold, L. H. Grouse, J. G. Derge, R. D. Klausner, F. S. Collins, L. Wagner, C. M. Shenmen, G. D. Schuler, S. F. Altschul, et al 2002. Generation and initial analysis of more than 15,000 full-length human and mouse cDNA sequences. Proc. Natl. Acad. Sci. USA 99: 16899-16903. Yamashita, M., M. Kimura, M. Kubo, C. Shimizu, T. Tada, R. M. Perlmutter, T. Nakayama. 1999. T cell antigen receptor-mediated activation of the Ras/mitogen-activated protein kinase pathway controls interleukin 4 receptor function and type-2 helper T cell differentiation. Proc. Natl. Acad. Sci. USA 96: 1024-1029. Iwamura, C., M. Y. Kimura, K. Shinoda, Y. Endo, A. Hasegawa, M. Yamashita, T. Nakayama. 2007. Schnurri-2 regulates Th2-dependent airway inflammation and airway hyperresponsiveness. Int. Immunol. 19: 755-762. Yamashita, M., M. Katsumata, M. Iwashima, M. Kimura, C. Shimizu, T. Kamata, T. Shin, N. Seki, S. Suzuki, M. Taniguchi, T. Nakayama. 2000. T cell receptor-induced calcineurin activation regulates T helper type 2 cell development by modifying the interleukin 4 receptor signaling complex. J. Exp. Med. 191: 1869-1879. Kimura, M., Y. Koseki, M. Yamashita, N. Watanabe, C. Shimizu, T. Katsumoto, T. Kitamura, M. Taniguchi, H. Koseki, T. Nakayama. 2001. Regulation of Th2 cell differentiation by mel-18, a mammalian polycomb group gene. Immunity 15: 275-287. Nakayama, T., C. H. June, T. I. Munitz, M. Sheard, S. A. McCarthy, S. O. Sharrow, L. E. Samelson, A. Singer. 1990. Inhibition of T cell receptor expression and function in immature CD4+CD8+ cells by CD4. Science 249: 1558-1561. Nigo, Y. I., M. Yamashita, K. Hirahara, R. Shinnakasu, M. Inami, M. Kimura, A. Hasegawa, Y. Kohno, T. Nakayama. 2006. Regulation of allergic airway inflammation through Toll-like receptor 4-mediated modification of mast cell function. Proc. Natl. Acad. Sci. USA 103: 2286-2291. Foster, P. S., S. P. Hogan, A. J. Ramsay, K. I. Matthaei, I. G. Young. 1996. Interleukin 5 deficiency abolishes eosinophilia, airways hyperreactivity, and lung damage in a mouse asthma model. J. Exp. Med. 183: 195-201. Takeda, K., E. Hamelmann, A. Joetham, L. D. Shultz, G. L. Larsen, C. G. Irvin, E. W. Gelfand. 1997. Development of eosinophilic airway inflammation and airway hyperresponsiveness in mast cell-deficient mice. J. Exp. Med. 186: 449-454. Koya, T., T. Kodama, K. Takeda, N. Miyahara, E. S. Yang, C. Taube, A. Joetham, J. W. Park, A. Dakhama, E. W. Gelfand. 2006. Importance of myeloid dendritic cells in persistent airway disease after repeated allergen exposure. Am. J. Respir. Crit. Care Med. 173: 42-55. Hosken, N. A., K. Shibuya, A. W. Heath, K. M. Murphy, A. O'Garra. 1995. The effect of antigen dose on CD4+ T helper cell phenotype development in a T cell receptor-α β-transgenic model. J. Exp. Med. 182: 1579-1584. Sallusto, F., C. R. Mackay, A. Lanzavecchia. 1997. Selective expression of the eotaxin receptor CCR3 by human T helper 2 cells. Science 277: 2005-2007. Finotto, S., G. T. De Sanctis, H. A. Lehr, U. Herz, M. Buerke, M. Schipp, B. Bartsch, R. Atreya, E. Schmitt, P. R. Galle, et al 2001. Treatment of allergic airway inflammation and hyperresponsiveness by antisense-induced local blockade of GATA-3 expression. J. Exp. Med. 193: 1247-1260. Kiwamoto, T., Y. Ishii, Y. Morishima, K. Yoh, A. Maeda, K. Ishizaki, T. Iizuka, A. E. Hegab, Y. Matsuno, S. Homma, et al 2006. Transcription factors T-bet and GATA-3 regulate development of airway remodeling. Am. J. Respir. Crit. Care Med. 174: 142-151. Zhang, D. H., L. Yang, L. Cohn, L. Parkyn, R. Homer, P. Ray, A. Ray. 1999. Inhibition of allergic inflammation in a murine model of asthma by expression of a dominant-negative mutant of GATA-3. Immunity 11: 473-482. Yamashita, M., A. Onodera, T. Nakayama. 2007. Immune mechanisms of allergic airway disease: regulation by transcription factors. Crit. Rev. Immunol. 27: 539-546. Hirahara, K., M. Yamashita, C. Iwamura, K. Shinoda, A. Hasegawa, H. Yoshizawa, H. Koseki, F. Gejyo, T. Nakayama. 2008. Repressor of GATA regulates TH2-driven allergic airway inflammation and airway hyperresponsiveness. J. Allergy Clin. Immunol. 122: 512-520. Huebner, K., T. Druck, C. M. Croce, H. J. Thiesen. 1991. Twenty-seven nonoverlapping zinc finger cDNAs from human T cells map to nine different chromosomes with apparent clustering. Am. J. Hum. Genet. 48: 726-740. Wu, Y., L. Yu, G. Bi, K. Luo, G. Zhou, S. Zhao. 2003. Identification and characterization of two novel human SCAN domain-containing zinc finger genes ZNF396 and ZNF397. Gene 310: 193-201. Li, J., X. Chen, H. Yang, S. Wang, B. Guo, L. Yu, Z. Wang, J. Fu. 2006. The zinc finger transcription factor 191 is required for early embryonic development and cell proliferation. Exp. Cell Res. 312: 3990-3998. Li, Y., Y. Wang, C. Zhang, W. Yuan, J. Wang, C. Zhu, L. Chen, W. Huang, W. Zeng, X. Wu, M. Liu. 2004. ZNF322, a novel human C2H2 Kruppel-like zinc-finger protein, regulates transcriptional activation in MAPK signaling pathways. Biochem. Biophys. Res. Commun. 325: 1383-1392. Ou, Y., S. Wang, Z. Cai, Y. Wang, C. Wang, Y. Li, F. Li, W. Yuan, B. Liu, X. Wu, M. Liu. 2005. ZNF328, a novel human zinc-finger protein, suppresses transcriptional activities of SRE and AP-1. Biochem. Biophys. Res. Commun. 333: 1034-1044. Prasad, A. S.. 2000. Effects of zinc deficiency on Th1 and Th2 cytokine shifts. J. Infect. Dis. 182: (Suppl. 1):S62-S68. Soutar, A., A. Seaton, K. Brown. 1997. Bronchial reactivity and dietary antioxidants. Thorax 52: 166-170.
de Luis, D. A., O. Izaola, R. Aller, A. Armentia, L. Cuellar. 2003. [Antioxidant and fat intake in patients with polinic asthma]. Med. Clin. 121: 653-654. Murgia, C., C. J. Lang, A. Q. Truong-Tran, D. Grosser, L. Jayaram, R. E. Ruffin, G. Perozzi, P. D. Zalewski. 2006. Zinc and its specific transporters as potential targets in airway disease. Curr. Drug Targets 7: 607-627. Truong-Tran, A. Q., R. E. Ruffin, P. D. Zalewski. 2000. Visualization of labile zinc and its role in apoptosis of primary airway epithelial cells and cell lines. Am. J. Physiol. 279: L1172-L1183. Maret, W., B. L. Vallee. 1998. Thiolate ligands in metallothionein confer redox activity on zinc clusters. Proc. Natl. Acad. Sci. USA 95: 3478-3482.